The property assessment challenge is one of several being mounted by Maine residents who have invested in solar but are finding higher taxes that diminish their energy savings. Rosanne Graef knew the costs would be steep when she, along with eight other families, invested in a set of solar panels that would stand on her old family property in Wayne. But the investment would cut Graef’s fossil fuel usage, which seemed like a worthy reason to proceed. When the array went online in 2016, it was one of the first community solar farms in Maine. Rather than producing electricity at their homes, the farms’ members live in different parts of the state and receive a corresponding credit on their power bills for every kilowatt generated at the Wayne site. But like dozens of Mainers who helped grow the state’s solar industry in recent years, Graef and her fellow farmers now face an unexpected challenge to the viability of their project: higher local taxes. After the array was built, the town assessed its value to be $137,300 — $87,300 more than what Graef and the other owners think its value should be. The resulting taxes, they say, could cut into their already slim savings and double the number of years they thought they’d need to recoup their costs. After Wayne officials denied the farm’s request for a tax abatement, its members appealed the decision to the Kennebec County commissioners. Their case will be heard at a March 6 meeting. Wayne isn’t the only Maine community in which a growing market for clean energy has bumped against the standard ways of collecting taxes. In South China, members of another community solar farm also think they were over-assessed and are considering requesting an abatement. In York, a groups of residents who installed solar panels on their roofs have applied for abatements, but the town recently denied those requests. In Brunswick, the owners of various solar projects have been discussing their tax assessments with the town. As those challenges mount, advocates for the solar industry warn that the traditional ways communities tax property could scare Mainers from making further investments in clean technology. Those investments contribute to society by reducing the amount of carbon that’s burnt, they argue, but require significant upfront and ongoing costs, such as for insurance, rent and maintenance. They also say that Maine should follow at least 20 other states, including several in New England, that have exempted residential renewable energy equipment from property taxes. About 25 states, along with Washington, D.C., have laws that exempt renewable energy equipment from property taxes, according to a database run by the N.C. Clean Energy Center Technology Center, at the College of Engineering at N.C. State University in North Carolina. Another three, including New Hampshire, have passed laws giving local governments the option to pass exemptions. Maine is alone among New England states in not having such a law on the books, and some industry watchers say it’s falling behind as a result of that and other factors. The number of new residential solar installations in Maine roughly tripled between 2012 and 2016, but the state is ranked 39th in overall solar development, according to the Solar Energy Industries Association. Less than one percent of the state’s electricity comes from the sun. Another challenge to the state’s solar industry was the decision by the state’s Public Utility Commission to gradually phase out a financial incentive, known as net metering, that allowed solar panel owners to receive a credit on their electric bill equal to the value of any excess energy they generate. Opponents of net metering, including Gov. Paul LePage and Central Maine Power, have argued that it increases costs for other electric customers, and a bill that would have temporarily preserved the incentive was vetoed last summer. Towns, meanwhile, say they’re simply following the rules for determining property value, but also acknowledge the unique quality of the cases before them. 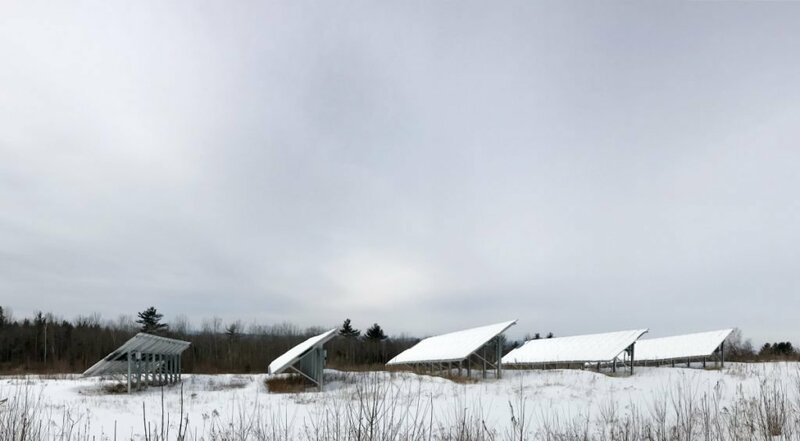 After hearing a presentation from the Sierra Club, Graef decided to lease the land to a group of people, including herself, who would install a 49.6-kilowatt solar array and use its power to offset their bills from Central Maine Power Co. The company that built the array, ReVision Energy, has encouraged that approach for people who may want to invest in solar, but can’t install panels on their homes. About 10 other farms exist around the state, according to one company official. Graef, who lives in Portland, mainly wanted to help the environment and recognized that any savings from the project would be a long time coming. Still, when her first tax bill arrived, it struck her as too high. She applied for a tax abatement, along with the eight other families who belong to the solar farm. They have mailing addresses in Portland, South Portland, Freeport, Orr’s Island, Mount Vernon and Camden, according to documents provided by the town. Graef and the other members paid their taxes at the assessed rate, she added, as they didn’t want a lien placed on the property. But the town denied their abatement requests. Matthew Caldwell of the Pittsfield firm RJD Appraisal wrote letters last August to the individual members of the farm. They had failed to demonstrate his assessment was “manifestly wrong,” a legal standard established in a 1999 case, City of Biddeford v. Adams, according to Caldwell. He also indicated that Wayne has no policy excluding solar panels from tax valuations. “In closing, you have not supplied sufficient evidence to demonstrate that your assessment is illegal, unjust or excessive,” Caldwell wrote. In an email, Caldwell declined to speak with the Kennebec Journal and referred questions to the town’s attorney, citing the ongoing appeal process. Attorneys representing the solar farm, though, say he missed the mark. Collins, in a letter appealing the denial to the Kennebec County commissioners, said the assessor should have used a different method to determine the solar farm’s value. She estimated the fair market value of the Wayne property to be $50,000 — roughly a third of the town’s assessment. In an interview, she said that she engaged a private appraiser to determine that amount. Rather than valuing the solar farm on the basis of its replacement cost, Collins said, the assessor should have considered it an “investment property” whose value is more dependent on income and costs. While it’s hard to forecast how productive a solar array will be, Hinchman estimated that it could take 30 years for the members of the Wayne farm to see a return on their investment at the current tax rate. It’s not clear what decision the Kennebec County commissioners will make in the solar farm appeal. The three commissioners have not stated their opinions, as no hearing has been held, said County Administrator Robert Devlin. But given the current and potential challenges to the assessments of other solar projects around Maine, advocates for the industry say that Maine should consider creating a property tax exemption for panels and other equipment, so that the industry will have a better chance of growing here. Another person who is following the outcome of the Wayne farm’s appeal process is Robert Flory, the president of a community solar farm in South China. The owners of that array are also thinking about requesting an abatement on their taxes, Flory said. In Brunswick, Assessor Cathleen Jamison said that owners of solar properties have been meeting with her to discuss their taxes, but haven’t filed a formal abatement request. In York, about a dozen residents with solar panels on their roofs recently had their abatement requests denied. “Some towns do tax them and some don’t,” said York’s assessor, Rick Mace, who compared the recent round of abatement requests to the “uproar” when towns first started taxing lobster traps. If residents are concerned about the taxes on their solar panels, Mace urged them to contact their lawmakers and seek legislation providing more direction to towns. He didn’t take a position on the merits of an exemption, but said the state currently has no law that allows towns to exempt solar equipment from property value. William Healey, president of the Maine Association of Assessing Officers and the assessor for Lewiston, didn’t respond to requests for an interview about the challenges of assessing solar. Steve Kahl, an associate professor of science at Thomas College who has developed renewable energy projects, said that Maine’s lack of a tax exemption for residential solar projects is part of a larger neglect by the state’s leaders of a promising industry. Local officials should make sure they aren’t taxing solar projects in a manner that would dissuade residents from pursuing them, he said, and state officials should consider creating more incentives for the industry.